Chatting with brothers Kasliwal, observing them interact, you get a strong sense of ‘la familia’ at work. No, no Corleone undertones here! I mean that in the nicest sense, old-world Jaipur sense. 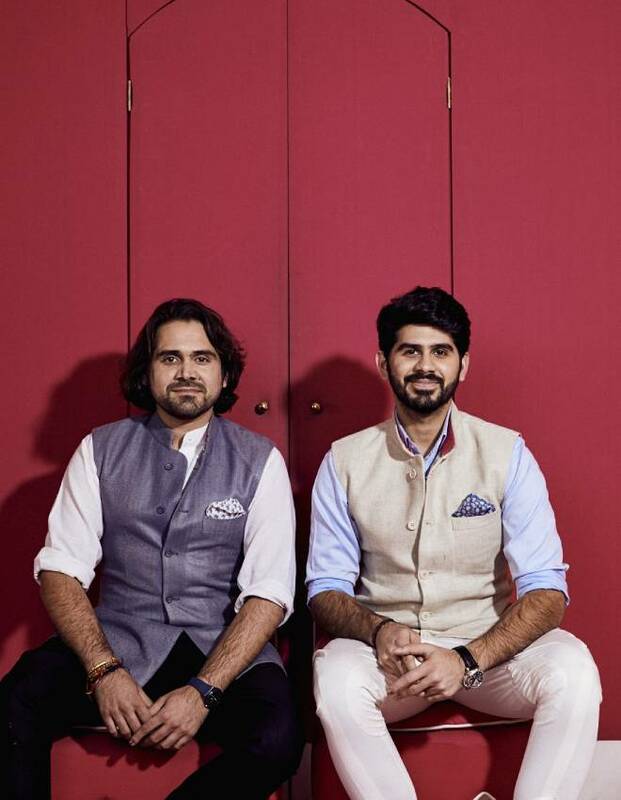 Handsome, privileged, at once entitled and well-bred in their deference, Siddharth and Samarth Kasliwal’s is a tale of family, brotherly bonds and rootedness. And yes, in the finest Pink City business traditions, of clan dynamic and intrigue. We are on the terrace of Gem Palace in Jaipur one January afternoon, the celebrated 150-year-old haveli creaking and settling around us comfortably in the warm winter sun, lazy Sunday sounds ebbing and flowing… birdsong, distant honking on Mirza Ismail Road 50 feet away, cries of woh kaata as another kite dips and falters against the Makar Sankranti sky. The Kasliwal ‘boys’ are in their element as they tend to gushing geriatric American ladies in their pink lacquered atelier atop the iconic Gem Palace. Sales are not happening with these thrifty alumnae from Mount Holyoke, Massachusetts, but they don’t let up, unfailingly charming as they order tea and conversation. 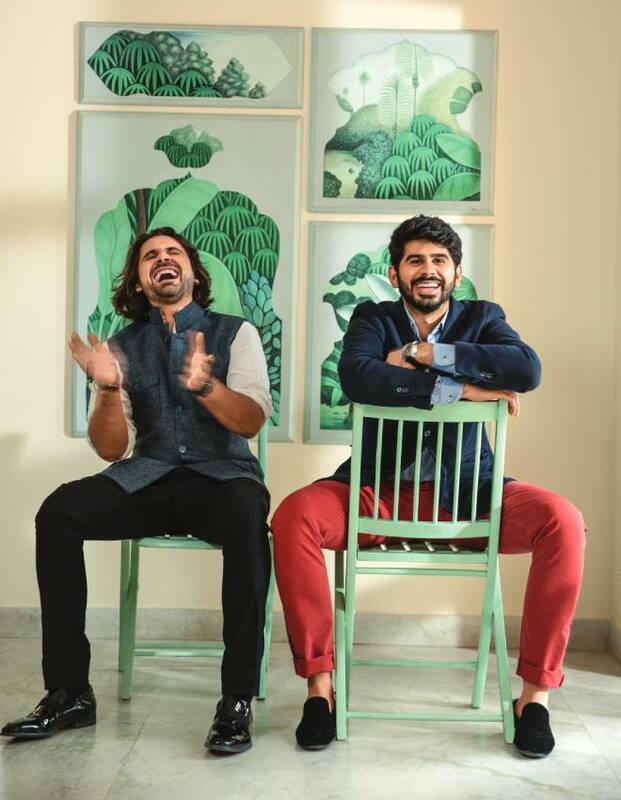 But getting them to sit down for an interview, especially the older sibling Siddharth (Sid to friends), is not easy. Even on a Sunday afternoon. When I am escorted to the rooftop at the appointed time by Samarth, Sid is busy on a call with a friend in LA, trying to interest a disinterested Pedro with a ball, texting with a client as we sit chatting under the marquee. And then taking off downstairs to the store because customers want the final pricing from bhaiya, who thumps a large gentleman in white on the back on his way down. I distract myself with the Beagle and conjecturing about the large gentleman in white, who snoozes in the sun away from us and who I can’t quite place. The Kasliwal ‘boys’ are in their element as they tend to gushing geriatric American ladies in their pink lacquered atelier atop the iconic Gem Palace. 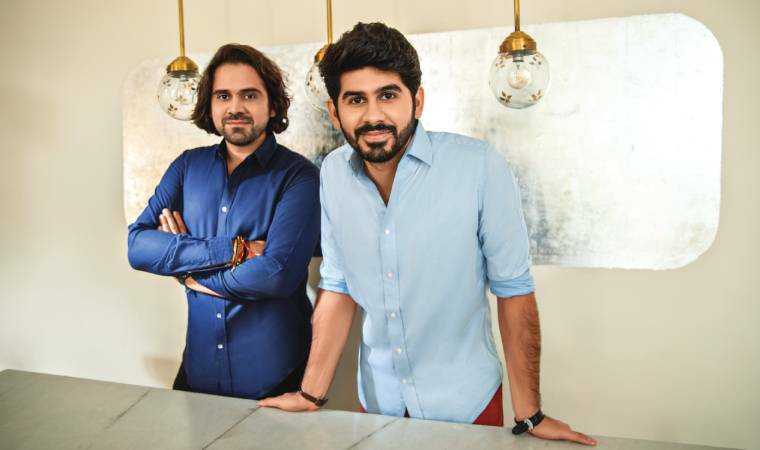 “As you can see, I love what I do,” he is expansively cordial when he can finally tear himself away, talking about running his late father’s part of the business with younger brother Samarth and cousin Sarthak. “Unfortunately, I can’t draw like my Dad did. But I love the creative process, handling the roughs, sourcing the stones, attending trade shows. 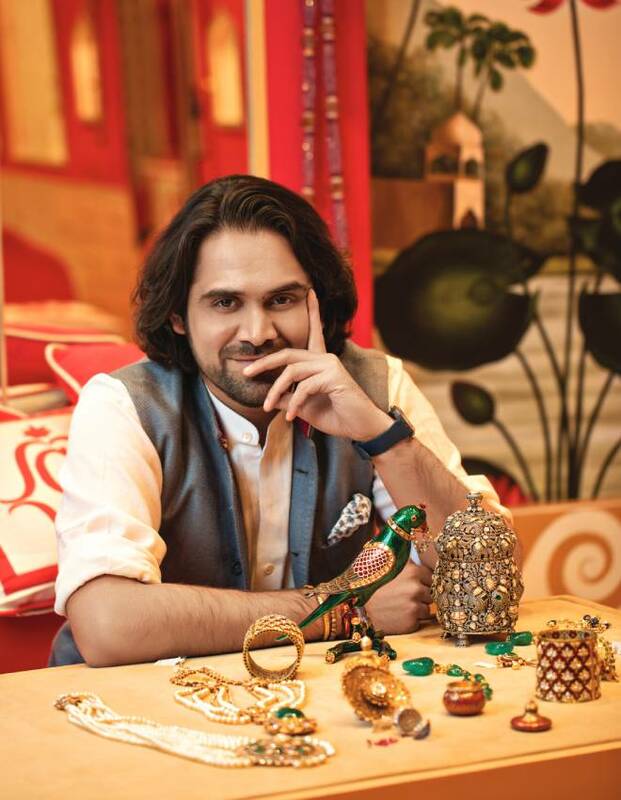 I love travelling and taking pictures of local architecture, murals, art of Shekhawati, Orchcha… they all go into inspiring designs for our jewellery lines,” he says as he dwells on the six generations of Kasliwal legacy and tutelage under his late father, Munnu. Munnu, who devastatingly lost a fight to brain cancer in 2012, is silently present when Siddharth talks of growing up in a joint household with his grandma and older uncle Sudhir’s family. The tale of the brothers is that of family and kinship — the curious clash of interests and values that characterises so many old families today. But in all the extended family dynamics, the siblings come through as incredibly close. Heck, they even make it to the Town & Country’s Top 50 Bachelors together! The tale of the brothers is that of family and kinship — the curious clash of interests and values that characterises so many old families today. Oh we did, we did, Samarth! You can see how strong the sense of la Familia is in both. 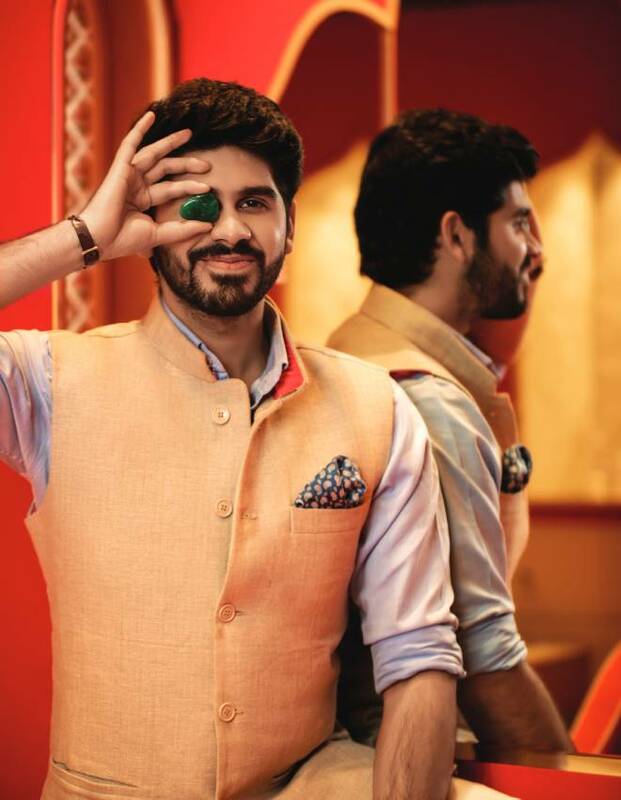 Following bhaiya to school at Ajmer’s Mayo College, internship at the Met (Metropolitan Museum of Art of New York City) and later to the family business comes naturally to this affable 25-year-old. Admittedly “not really inclined to business”, he wants to play his part. Be a good son, a good brother, be “less selfish”. “Gem Palace is important,” he says earnestly, “but the family is much more than that.” Apparently, the values imbibed at Mayo, "respecting your seniors, standing up for yourself’ drive him to put aside his other interests for a while to focus on business, do as the family would have it. At this age, a young guy might be more restless. This is what coming from a traditional business family does to you, I guess. Or being in your comfort zone. Samarth, who is 25 to Sid’s more self-aware 34, at once chalk to his cheese and a chip off the old block, is disarming in his adulation. 28 Kothi has evolved as a luxe guesthouse for women artists, designers, writers looking for a long stay in Jaipur, run largely by women to ensure greater security, especially foreign travellers with a completely vegan/vegetarian café. 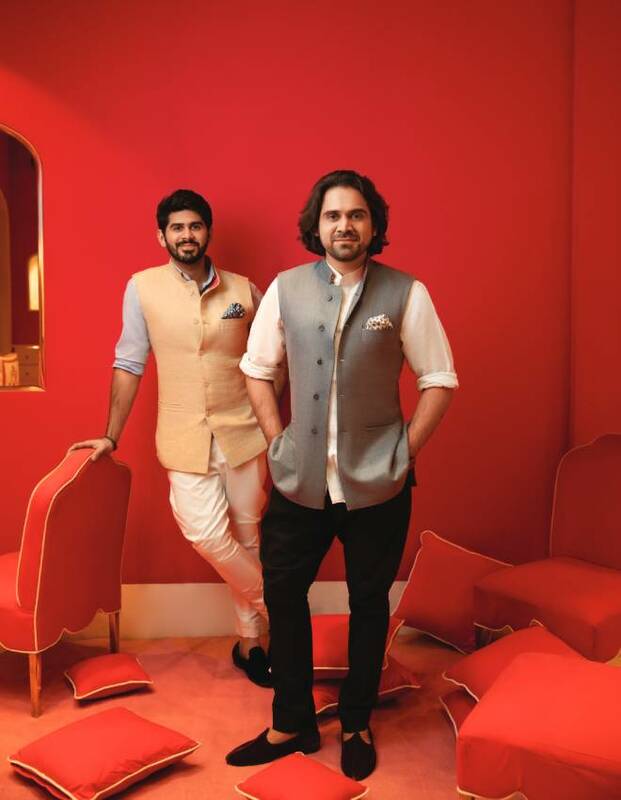 Up next is a second hospitality project, no nightclubs, bars or hotels though, because they want to be good Jains, the brothers hasten to say. And an art project that Samarth is keeping under wraps for the moment. And what of mom? “Mom is tense. I’m not!” he grins. Obviously, losing a still young father in his prime seven years ago shifted a lot of things for him, including priorities. And marriage most definitely is not one. The two handle their father’s business — Siddharth has taken on his dad’s role in grooming Samarth. “Marriage is like checking yourself into a prison." They are not big on jewellery. Or on fashion. Capisce? So, what is it that defines their style then? The Man raided their wardrobe to get the lowdown for you, gentlemen, and discovered an easy style born of rubbing shoulders with class all their lives. And yeah, Mom has a large role in what they wear! Like everything else, even when it comes to styling their look, the brothers seem to be in sync with each other. Psst… is there a family code in place here? I mean, is it mandatory that both swear by customised clothes, the colour blue and Hot Pink, their mother’s store at Jaipur’s Narayan Niwas Palace. Form-fitting hunting jackets, shirtsleeves rolled up to the elbow and trousers, and they are good to go, they say. Evenings can see Siddharth teaming up the jacket with breeches while Samarth often goes with a ‘nice’ dinner jacket usually in his favourite blue that he calls ‘a shade of navy’. The guy is big on pocket squares and will often match them to his shoes. “So, if it’s a red square, red shoes it is,” he confesses laughingly! And when in New York, where Siddharth spends a good part of the year every summer, an Indian or Western jacket in his favourite blue worn over a pair of jeans is all that this man about town needs to suit up. “I like to dress smart but I am not big on fashion,” he declares. 28 Kothi has evolved as a luxe guesthouse for women artists, designers, writers looking for a long stay in Jaipur, run largely by women to ensure greater security, especially foreign travellers with a completely vegan/vegetarian café. Oh yeah? I look at him in disbelief. I mean, c’mon, just look at the guy. Dapper, no matter where he is. At the atelier, charming a bunch of American ladies out to make a ‘bargain’. Finishing up a round on the Jaipur greens. Or at his tony Upper East Side atelier, posing for the New York Times. Only after a great deal of prodding on his favoured brands does he come up with Ralph Lauren (for tees): “I’m a completely customised man.” Ditto for kid brother. 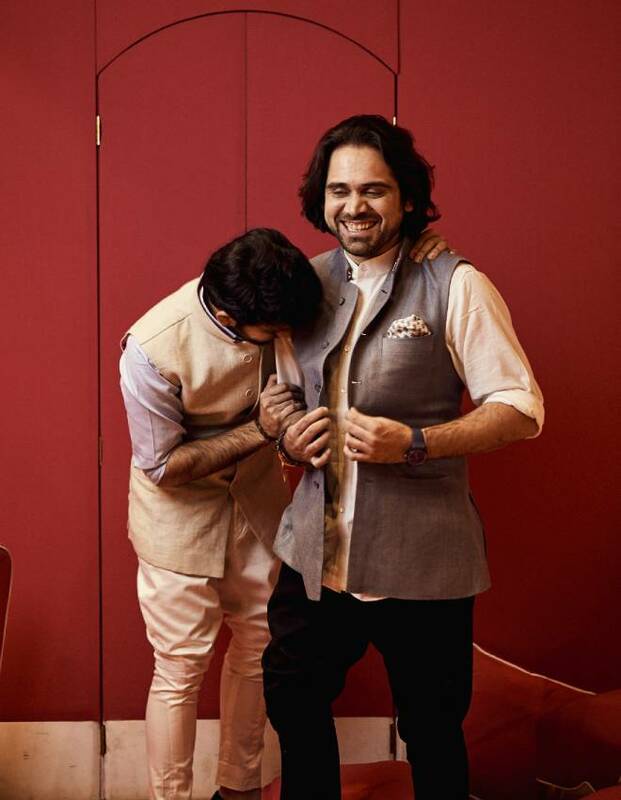 “Because when it comes to bespoke, no one can beat Indian tailors, can they?” Samarth explicates. Not just threads, Hot Pink is a staple even for shoes for both, who practically live in their customised jootis from Mom’s karigars. Other than them, Siddharth reveals he can be found only in his favourite Loro Piana loafers for “their pure comfort". So much so, that he has them in every colour… black, red, blue, brick, emerald green, moss green, another shade of blue… you name it, the guy has it. The younger Kasliwal, on the other hand, is more eclectic. What with his Tod’s, Ferragamos (“a bit common now, don’t you think,” he muses), and his Brunello Cucinelli that he just loves, loves, loves! And what of jewellery? 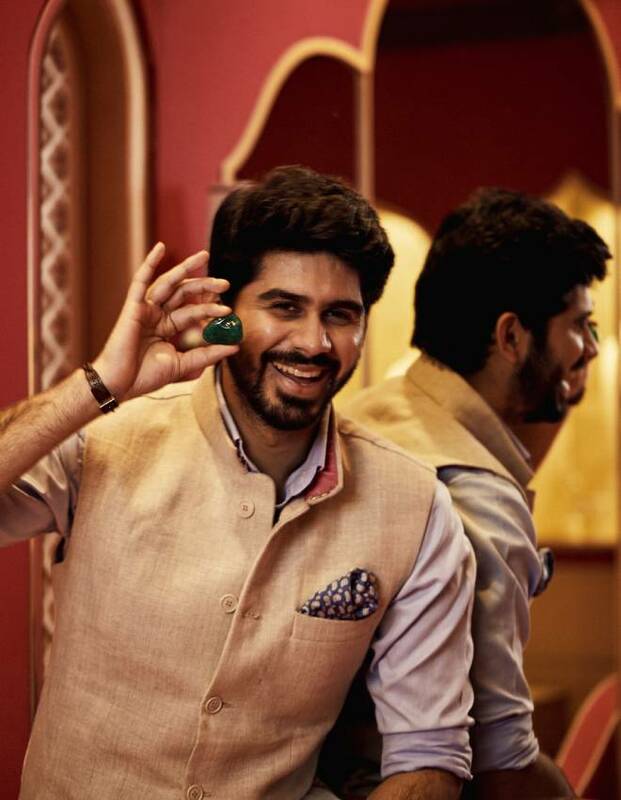 “The Kasliwal men are not big on jewellery,” says the younger sibling. No heavy bracelets, chains or pendants for them. “No man in the family wears any jewellery other than fancy buttons from our store”, typically in diamonds and rubies and typically on bandhgalas worn over jodhpurs. The buttons, a collection of small and chic brooches, and “things that Dad left us, some cufflinks and signet rings,” are all the jewellery the brothers possess and wear. Though Samarth is a tad partial, he says, to a present of Verdura cufflinks from the haute jewellery line after his stint interning at their headquarters in NYC. While Siddharth may claim to be "not big on fashion", he sure is experimental, as outed by bro. “I wear crazy colour pants… green, orange, purple,” he laughs when confronted. Obviously, here is a man in his prime, comfortable in his skin, breaking boundaries, being himself with his easy style. Samarth is not yet ready to do that. Having fun with his pocket squares and shoes is as far as he will go. Yet. But he’s getting there, oh yes, he sure is getting there. Evenings can see Siddharth teaming up the jacket with breeches while Samarth often goes with a ‘nice’ dinner jacket usually in his favourite blue that he calls ‘a shade of navy’. Rich and regular or broke and sassy? Mile high or drive-in theatre? Fun ’n games or coffee and conversation? Siddharth: Golf. It’s like meditation for me. Samarth: Polo, definitely. Any day! I ride. So, yeah! Cream puffs or death by chocolate? 20 & demure or 30 & poised? Samarth: 30 & poised. Innocence was fun in high school! Better to have loved and lost or never to have loved at all? Ma ki pasand or self-driven? Samarth: Self driven but has to be ma ki pasand! Basant Panchami or Valentine’s Day?